After a long day, Denver Donuts come out on top! I think I speak for both teams, this was a LONG day. Both of our finalists played in at least 4 games between their co-ed and men's games and both were gassed by the end of their final game. 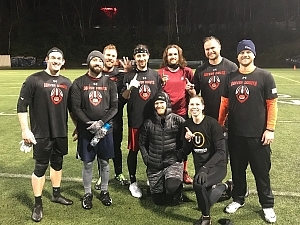 It was a tight back and forth game to start, but Denver Donuts seemed to have a little more left in the tank, as they pulled away in the second half to win 40-18. Congratulations on a well-deserved championship gentleman!